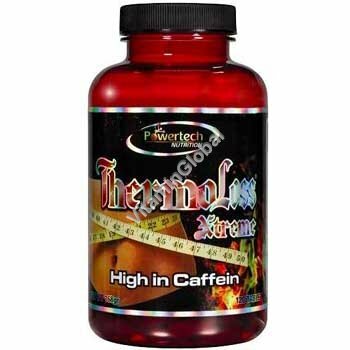 ThermoLoss Xtreme is an innovative nutritional supplement which was developed on the basis of studies that examined various fat burning supplements. ThermoLoss Xtreme helps speed weight-loss by boosting the metabolism while burning calories, and not by suppressing appetite. Appetite suppression is problematic because it can lead to a lack of proper nutrition, which is counterproductive to good health and boosting energy levels. ThermoLoss Xtreme helps to increase wakefulness, improves exercise capacity, and increases caloric expenditure during exercise. ThermoLoss Xtreme used in combination with a healthy lifestyle of proper nutrition and regular exercise produces the best and fastest results. CLA - Conjugated linoleic fatty acid has been extensively studied and found to be most effective for inducing a decrease in fat. Other studies have shown that it supports an increase in muscle mass and supports the immune system. Caffeine - a natural alkaloid that stimulates the central nervous system and contributes to increased adrenaline and therefore increased wakefulness and improved physical ability and strength, particularly in the context of aerobic activity. Caffeine contributes to the release of fatty acids into the blood stream and increases their availability, helps raise the pain threshold, and even improves glucose absorption. All of these effects are especially desirable during periods of exercise and strenuous activity. Ginseng - this plant is a natural stimulant which acts synergistically with caffeine to stimulate the nervous system and reduce fatigue, thereby helping to improve exercise capacity while promoting weight loss. Taurine - an amino acid with a strong anti-inflammatory effect. Taurine acts as an anti-oxidant. In addition, taurine improves the effect of caffeine on the nervous system. Taurine increases the absorption of fluids in the muscle cells and thus contributes to increased muscle volume. Alpha Lipoic Acid, Magnesium and Chromium Picolinate - all three contribute to the improvement of muscular metabolic function . Other ingredients: filler (cellulose, calcium carbonate, maltodextrin), acidity regulator (citric acid), disintegrant (croscarmellose, sodium bicarbonate), and pigment (titanium dioxide, chlorophyll extract). ThermoLoss Xtreme tablets do not contain: yeast, wheat , sugar or starch, and is produced with no preservatives or artificial flavors. Instructions for use: 2 tablets per day: One tablet in the morning before breakfast and one tablet in the afternoon before training. If one is not training, it is highly recommended to take the second pill in at least four hours before bedtime, as the consumption of caffeine can make falling asleep difficult. Not recommended for pregnant women and children under the age of 12. Not recommended for those who consume high-caffeine foods, medicines, or supplements. Do not use the tablet as a stimulant. Pregnant women, nursing women, people taking prescription drugs, and parents who wish to give this product to their children should consult a physician before use.